At A Loss is one of the albums that I was looking forward to the most this year. Ever since 2012's double shot of the Sarah 7" and the Lessons On Love, Sharing and Hygiene LP, The Capitalist Kids have been the standard that I've held every pop punk band up to. They've got the Mr. T Experience catchy tunes with smart lyrics thing down pat. This is evident from the opening moments of the first song on the album "Not '95." 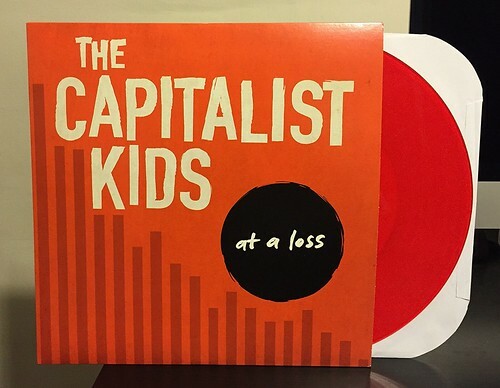 It's essentially the Capitalist Kids' version of MTX's "Dumb Little Band." Self deprecating and funny, but just crammed full of melody and warm fuzzy guitar. The rest of the album keeps this high standard of quality as you move through it. There's songs about girls, songs about overpopulation, songs about girls, songs about racism, songs about girls, songs about capital punishment and songs about girls. There's a pretty solid dose of left leaning politics here if the song topics don't clue you in, but they're tackled in an upbeat, humorous way. They're also addressed in a way that's that's still factual and raises some pretty good points. It probably helps that I agree with most of their messages going into the album, but I still think they manage to deal with everything without sounding condescending or preachy. Most importantly the tunes are there. So even if you get to a song called "Comin' Up Milhouse," it doesn't matter if you're like me and don't get whatever Simpsons reference they're talking about, the song is still great. If I had to compare the two, I probably like Lessons on Love, Sharing and Hygiene slightly better, but At A Loss, is right up there and pretty darn close to being just as good as that last phenomenal album. Absolutely recommended.